The only reason that I picked up this book was its short length. 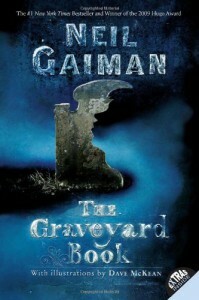 I wasn’t very excited for Mr. Gaiman’s work after reading “the ocean at the end of the lane”. And this book like his latest one also revolves around a small boy but this book proves me wrong. And I'll be reading more of his work in near future. After his family’s murder, young Nobody Owen is adopted by an old graveyard couple. They raise Bod (short for Nobody) as their own son. Silas, another inhabitant of the graveyard, agrees to be Bod’s guardian. He take care of food, clothes and studies for Bod. As Bod grows up he comes to know that Jack, the murderer of his family, is still on his trail and wants him dead. Every chapter of this book is an adventure and a lesson well learned for Bod. In fact each chapter is a short story in itself. The world created in the book is wonderful. it is scary yet full of surprises. Residents of graveyard are even more amazing and so protective of Bod. It is a well written story. it is dark at places but also humorous. It made me smile, laugh and sad. Its a beautiful story and a must read for anyone who loves to read.